I haven't posted here in almost 2 month, still shooting and posting more often on Instagram (@dansmith709). Saturday night was calm and there was a gorgeous sunset, as usual, over Conception Bay. A huge bird, possibly a cormorant, was flying towards the sun this morning as I watched it crawl over the horizon from the point in The Gut. It was a glorious morning; the sun was blazing, there was no wind or drizzle, and there were hundreds of birds. While the majority of my feathered friends were seagulls, there were also a bunch of ducks, at least one other cormorant, an eagle, ravens, crows, little songbirds; it was great way to start an extra-long weekend. I haven't posted here in a while. This blog has turned into more of place to drop some thoughts with an image or two. I've been shooting a fair bit and dumping a few things on the gram (@dansmith709 add ya boy). After work today Bigg-E and I went down to Middle Cove beach to shoot the rolling tide. A beautiful dog followed us around the whole time we were there. He was alone, but I've seen him at the beach there before. He was also huge. After an amazing few hours of listening to photographer Dave Howells at a meeting of Camera 35 I stopped downtown for a second on my way home. I got out in front of Bad Bones and waited for a satisfied customer to come out to make a shot, but then this happened and it was more satisfying than what I was awaiting. 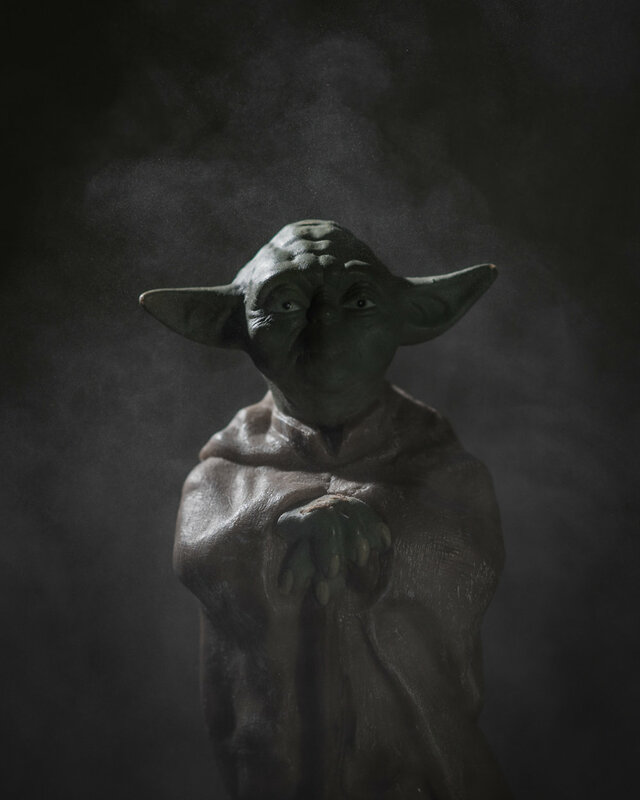 Playing around with some fog-in-a-can and Master Yoda was really giving me the gears for fumbling with the lighting. I can't wait to see Episode 8 again, lol.